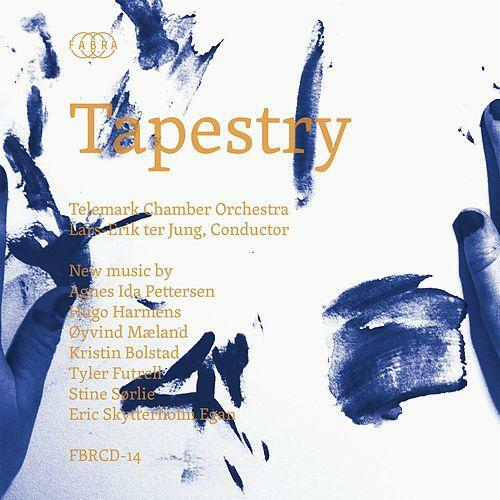 Today we have a very handsome hard-bound book volume of the CD Tapestry (FBRCD-14), a collection of Norwegian high modernist new music performed with great verve by the Telemark Chamber Orchestra strings under Lars-Erik ter Jung. The works are by composers likely to be unfamiliar to those not immersed in the local new music scene in Norway, but they are a talented bunch that give us a very worthy sampling of highly interesting works. Who are they? Agnes Ida Pettersen, Hugo Harmens, Oyvind Maeland, Kristin Bolstad, Tyler Futrell, Stine Sorlie and Eric Skytterholm Egan. The composers are young, born between 1978 and 1985, and show a high-watermark concern for a great variety of sound color and aural vividness via a full gamut of traditional and extended string techniques and a thorough sensitivity to orchestrational poetics. They are all recent, fairly short works ranging from around four to twelve minutes apiece, allowing for a full spectrum of new music composers and a breadth of significant work of striking beauty. There is high-modern tonal and extra-tonal edginess to be heard, a sort of impressionistic luminousness and Nordic naturalness to the music. It is music of wonder, played wonderfully well and recorded with bright and lucid sound staging. The first edition is available in a run of 300 numbered copies. This is one of the more enchanting high-modernist orchestral offerings I've heard in a long while. Anyone with an appreciation for new music adventure and atmospherics should not hesitate to get this one. The Telemark Chamber Orchestra give us superlative performances and the music has a grippingly beautiful quality. Get this if you can!